Oysters can be found wherever the conditions for their survival are met. The requirements of water temperature and salinity are paramount while the need for ample food guarantees its continued health. These environmental requirements are often found where a source of fresh water and sea water meet - at the mouths of rivers and estuaries. As a result, oysters have been a part of the cuisine of many seacoast countries for centuries. Asia: Pacific oysters can be found in New Zealand, Australia, Korea, China, and Japan. Sushi bars routinely include raw fish of various kinds so the raw oyster is just one of many possibilities. Cooked oysters also play a significant role in the cuisine of these countries. The smoked oysters that we find in our super markets typically come from either China or Korea. The cost of oysters in Asia can be dramatically lower than ours but the traveling distance of fresh oysters is prohibitive. Nevertheless, most of the Pacific Coast oysters in the U.S. and many of the oysters in Europe today are of Japanese origin. So consuming them with Sushi condiments and Sake is an exquisite culinary delicacy. Europe: The first documentation of oyster farming describes efforts by the Romans to transplant oysters and grow them for consumption. Nero is said to have been able to tell the home origin of an oyster by its taste. The Romans delighted in the oysters in Great Britain and brought them back to Rome packed in seaweed in the holds of their ships. Casanova was perhaps the greatest marketeer of oysters in the history of mankind and is said to have consumed them in great quantity. There are places in Europe where native oysters are still available. An oyster of Japanese descent (Crassostrea gigas) in Great Britain is often referred to as a "Rock Oyster." In France, the "Portuguese" oyster was commonly thought to have originated when a ship bearing oysters from Japan sank in a Portuguese harbor. Many of the native oysters in Normandy have been replaced by more disease-resistant oysters of Japanese descent. The same can be said of the oysters in Holland. Noted exceptions are the famous Irish oysters in Galway, which are still native, the Falmouth oyster in England, and Belon oysters so-named after the Belon River in France. Denmark also still farms its local native oysters. All of these are still Ostrea edulis, or European oysters. They are more round and flat than the virginica and have a significantly different flavor. There is a grand tradition of oysters in Europe, especially in France. Beverages are routinely matched with the oysters of a region in the same way as they are with other foods. Champagne and other fine wines are more common with raw oysters in France while dark beers are more common with oysters in England and Ireland. United States: In the United States, we have our own culinary tradition of oysters. The Union Oyster House in Boston is said to be the oldest surviving restaurant in America. Its history goes back to Colonial times. Oyster stew is a staple at the Oyster Bar at Grand Central Station in New York City. 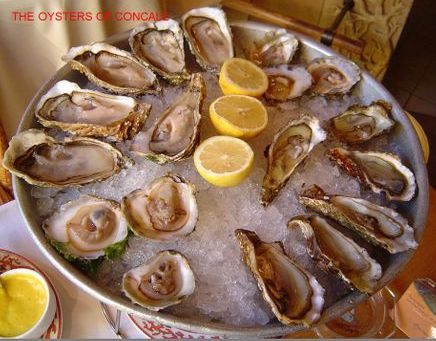 Its menu of raw oysters is often encyclopedic - 30 or 40 different kinds are served raw. Washington D.C. was geographically located close to Chesapeake Bay and was traditionally awash with oysters. The Bay witnessed a dramatic decline of its wild oysters and then, in recent years, a renaissance from the new forms of hatchery-based farming techniques. New Orleans has its own tradition. Oysters Rockefeller was born at Antoine's Restaurant in New Orleans when the restaurant ran out of snails. Oysters are more likely to be presented cooked in the Southern U.S. in order to control the possibility of disease in the summer months. All of the native Atlantic Coast oysters in the U.S. are of a species Crassostrea virginica, from Maine to Galveston, Texas. In recent years, European Flats (Ostrea edulis) are being harvested in Maine. They grow "wild" as a result of a failed farming endeavor in the mid-20th Century. East Coast hatchery-based farms grow virginica oysters exclusively. The original Pacific Coast oyster was a small creature known as the Olympia (Ostrea lurida). It was available along the entire coast from Seattle south. San Francisco was a center for oyster consumption during the Gold Rush. Hundreds of Easterners arrived on the West Coast already equipped with a taste for raw oysters. The Gold Rush and ensuing forestry industry on the West Coast nearly wiped out the Olympia oyster on the Pacific Coast. Aquaculture and the influx of the Japanese oysters in the early 20th Century saved the industry. The Pacific oyster (Crassostrea gigas) is the workhorse and the Kumamoto (Crassostrea sikamea) is farmed there in great quantities. The oyster cuisine in the Pacific Northwest is thriving today with Seattle as the center of its universe. Both the East Coast (Crassostrea virginica) and European Flat (Ostrea edulis) are also farmed there now in limited quantities. Canada: Both the East Coast and West Coast of Canada have thriving oyster industries today. The West Coast has adopted the Pacific Oyster while the East Coast has retained its virginica origins. Canadian oysters served in the Winter months are often farmed by chopping though a layer of ice. Perhaps the most famous Canadian oyster of all comes from Prince Edward Island. The PEI oyster is said to be the only living creature to successfully rid itself of cancer. Mexico and Latin America: Knowledge and news of oyster cuisine is sketchy for us on this subject at best. Barbara Brennessel mentions the presence of virginica oysters in Central America as well as Brazil and Argentina in her book Good Tidings. An oyster grower recently contacted OI announcing the presence of both farmed Pacifics and Kumamotos in Mexico. The international character of oysters and oyster cuisine is nowhere more apparent as in such circumstances. A Mexican grower is seeking to import Japanese oysters into the U.S.! Certainly hot sauce. lemon, and beer are not strangers to Mexican cuisine. The best Oysters Rockefeller in the Boston area employs a recipe allegedly from Cozumel, Mexico. Winged Oysters: While flying oysters from place to place allows for tremendous variety, it brings our sanity into question. How did we ever reach the point where oysters need wings for us to enjoy them? If you have never experienced a savory oyster, you have no answer to this question. If you have, you are simply seeking the pleasure of perfection. When you do find it, express your gratitude by enhancing the fate of the natural world in other ways. A good rule of thumb: give back more than you take. To receive well is itself a gift. Note: The seasonal characteristics of oysters world-wide can be quite different. When it is Summer in New Zealand, it is Winter in New England. So, countries that have imported access to foreign oysters can supplement their local oysters with oysters from another season elsewhere in the world. Another development that has occurred recently is the perfection of the TRIPLOID oyster. Both C. virginica and C. gigas have been bred as "triploids" through sophisticated mating technology. These oysters do not reproduce. They stay fat during the time when other oysters of the same species are spawning. As a result, they grow very rapidly. In the U.S., triploids have become quite common in the Pacific Northwest and in Chesapeake Bay. A grower is not required to indicate what type of seed is used on his or her farm. The taste of the triploid oyster in Summer is significantly sweeter due to the continued presence of fat. The shell thickness of a triploid oyster can also change the shucking strategy.